can be used to determine whether a particular data value is close to or far from the mean. The number line may help you understand standard deviation. If we were to put five and seven on a number line, seven is to the right of five. We say, then, that seven is one standard deviation to the right of five because 5 + (1)(2) = 7. If x is a number, then the difference “x – mean” is called its deviation. In a data set, there are as many deviations as there are items in the data set. The deviations are used to calculate the standard deviation. If the numbers belong to a population, in symbols a deviation is x – μ. For sample data, in symbols a deviation is x – . To calculate the standard deviation, we need to calculate the variance first. 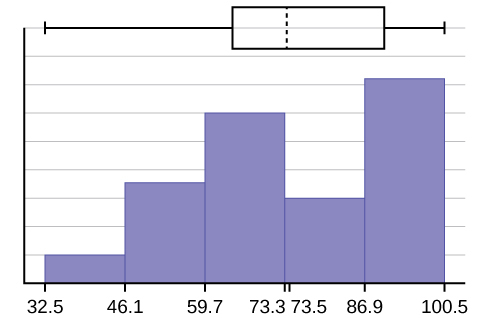 The variance is the average of the squares of the deviations (the x – values for a sample, or the x – μ values for a population). The symbol σ2 represents the population variance; the population standard deviation σ is the square root of the population variance. The symbol s2 represents the sample variance; the sample standard deviation s is the square root of the sample variance. You can think of the standard deviation as a special average of the deviations. The statistic of a sampling distribution was discussed in Descriptive Statistics: Measuring the Center of the Data. How much the statistic varies from one sample to another is known as the sampling variability of a statistic. You typically measure the sampling variability of a statistic by its standard error. The standard error of the mean is an example of a standard error. It is a special standard deviation and is known as the standard deviation of the sampling distribution of the mean. You will cover the standard error of the mean in the chapter The Central Limit Theorem (not now). The notation for the standard error of the mean is where σ is the standard deviation of the population and n is the size of the sample. 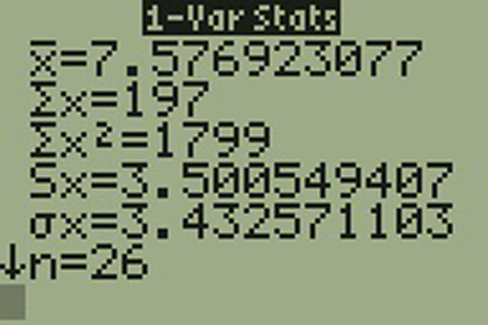 which is rounded to two decimal places, s = 0.72. For the following problems, recall that value = mean + (#ofSTDEVs)(standard deviation). Verify the mean and standard deviation or a calculator or computer. Find the values that are 1.5 standard deviations from (below and above) the mean. arrowing up into the name. Press CLEAR and arrow down. The deviations show how spread out the data are about the mean. The data value 11.5 is farther from the mean than is the data value 11 which is indicated by the deviations 0.97 and 0.47. A positive deviation occurs when the data value is greater than the mean, whereas a negative deviation occurs when the data value is less than the mean. The deviation is –1.525 for the data value nine. If you add the deviations, the sum is always zero. (For [link], there are n = 20 deviations.) So you cannot simply add the deviations to get the spread of the data. By squaring the deviations, you make them positive numbers, and the sum will also be positive. The variance, then, is the average squared deviation. where interval frequencies and m = interval midpoints. Find the standard deviation for the data in [link]. For this data set, we have the mean, = 7.58 and the standard deviation, sx = 3.5. This means that a randomly selected data value would be expected to be 3.5 units from the mean. If we look at the first class, we see that the class midpoint is equal to one. This is almost two full standard deviations from the mean since 7.58 – 3.5 – 3.5 = 0.58. While the formula for calculating the standard deviation is not complicated, where sx = sample standard deviation, = sample mean, the calculations are tedious. 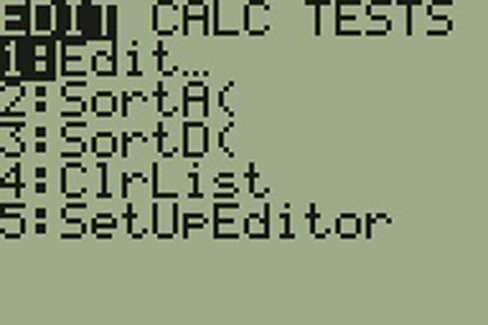 It is usually best to use technology when performing the calculations. King, Bill.“Graphically Speaking.” Institutional Research, Lake Tahoe Community College. Available online at http://www.ltcc.edu/web/about/institutional-research (accessed April 3, 2013). s = or s = is the formula for calculating the standard deviation of a sample. To calculate the standard deviation of a population, we would use the population mean, μ, and the formula σ = or σ = . 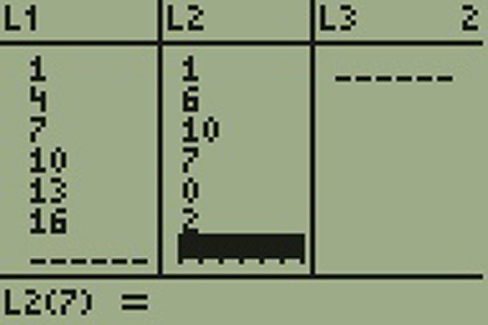 Fredo’s z-score of –0.67 is higher than Karl’s z-score of –0.8. For batting average, higher values are better, so Fredo has a better batting average compared to his team. A sample of 11 years is taken. About how many are expected to have a FTES of 1014 or above? Explain how you determined your answer. The median value is the middle value in the ordered list of data values. The median value of a set of 11 will be the 6th number in order. Six years will have totals at or below the median. What percent of the FTES were from 528.5 to 1447.5? How do you know? 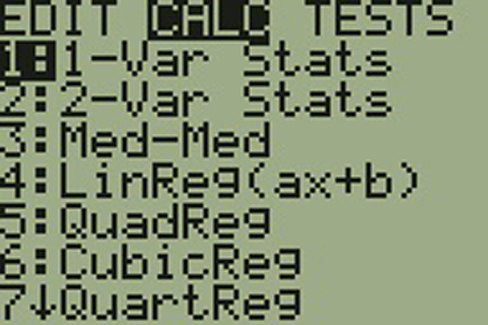 Calculate the mean, median, standard deviation, the first quartile, the third quartile and the IQR. Round to one decimal place. Compare the IQR for the FTES for 1976–77 through 2004–2005 with the IQR for the FTES for 2005-2006 through 2010–2011. Why do you suppose the IQRs are so different? Hint: Think about the number of years covered by each time period and what happened to higher education during those periods. A music school has budgeted to purchase three musical instruments. They plan to purchase a piano costing 3,000, a guitar costing 550, and a drum set costing 600. The mean cost for a piano is 4,000 with a standard deviation of 2,500. The mean cost for a guitar is 500 with a standard deviation of 200. The mean cost for drums is 700 with a standard deviation of 100. Which cost is the lowest, when compared to other instruments of the same type? Which cost is the highest when compared to other instruments of the same type. Justify your answer. For pianos, the cost of the piano is 0.4 standard deviations BELOW the mean. For guitars, the cost of the guitar is 0.25 standard deviations ABOVE the mean. For drums, the cost of the drum set is 1.0 standard deviations BELOW the mean. Of the three, the drums cost the lowest in comparison to the cost of other instruments of the same type. The guitar costs the most in comparison to the cost of other instruments of the same type. An elementary school class ran one mile with a mean of 11 minutes and a standard deviation of three minutes. Rachel, a student in the class, ran one mile in eight minutes. A junior high school class ran one mile with a mean of nine minutes and a standard deviation of two minutes. Kenji, a student in the class, ran 1 mile in 8.5 minutes. A high school class ran one mile with a mean of seven minutes and a standard deviation of four minutes. Nedda, a student in the class, ran one mile in eight minutes. What is the best estimate of the average obesity percentage for these countries? What is the standard deviation for the listed obesity rates? The United States has an average obesity rate of 33.9%. Is this rate above average or below? How “unusual” is the United States’ obesity rate compared to the average rate? Explain. The obesity rate of the United States is 10.58% higher than the average obesity rate. Since the standard deviation is 12.95, we see that 23.32 + 12.95 = 36.27 is the obesity percentage that is one standard deviation from the mean. The United States obesity rate is slightly less than one standard deviation from the mean. Therefore, we can assume that the United States, while 34% obese, does not hav e an unusually high percentage of obese people. [link] gives the percent of children under five considered to be underweight. What is the best estimate for the mean percentage of underweight children? What is the standard deviation? Which interval(s) could be considered unusual? Explain. Following are the published weights (in pounds) of all of the team members of the San Francisco 49ers from a previous year. Refer to [link] determine which of the following are true and which are false. Explain your solution to each part in complete sentences. Use the following information to answer the next two exercises.X = the number of days per week that 100 clients use a particular exercise facility. Suppose that a publisher conducted a survey asking adult consumers the number of fiction paperback books they had purchased in the previous month. The results are summarized in the [link]. a number that is equal to the square root of the variance and measures how far data values are from their mean; notation: s for sample standard deviation and σ for population standard deviation. mean of the squared deviations from the mean, or the square of the standard deviation; for a set of data, a deviation can be represented as x – where x is a value of the data and is the sample mean. The sample variance is equal to the sum of the squares of the deviations divided by the difference of the sample size and one. Measures of the Spread of the Data by OpenStaxCollege is licensed under a Creative Commons Attribution 4.0 International License, except where otherwise noted.